We receive many queries from people asking about how to research ancestors who were thought to have been priests. In this blog entry I will try to describe some useful sources of information. In the text that follows the sources are given by numbers in brackets and the full citation details are given at the foot of the article. The first places to look are in English & Welsh Priests (1) and (2) which are simple lists and will help to confirm the basic facts. Kelly’s Notes on English Catholic Missions (3) which was reprinted (4) and is now available on-line (5) has the names and years, where known, of the priests associated with each mission for years up to 1907, when this work was produced. Of course for this to be of use, you will need to know the missions or churches where your ancestor served. Many churches have produced histories ranging from books to pamphlets and information is often now available on the web. These will usually have some information about priests who served there. Local newspapers will often contain obituaries, particularly if the priest was well known or had served for many years. Don’t forget the Catholic Directory published every year gives the priests at each mission or church as this entry from the 1858 edition shows. Gandy’s Bibliography (6) has a whole section on the Clergy and gives many more suggestions than I have listed in this article. 1. Bellenger, Dominic Aidan. English & Welsh priests, 1558-1800 : a working list. Bath : Downside Abbey, 1984. 2. Fitzgerald-Lombard, Charles. 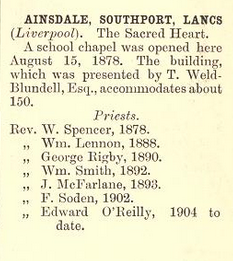 English & Welsh Priests 1801-1914 : A Working List. Bath : Downside Abbey, 1993. 3. Kelly, Bernard W. Historical Notes on English Catholic Missions. London : Kegan Paul, Trench, Trubner & Co. Ltd., 1907. Reprinted by Michael Gandy 1995. 4. —. Historical Notes on English Catholic Missions. London : Michael Gandy, 1995. with the omission of an introductory essay on the history of Catholicism in England since the Reformation and the addition of an alphabetical index by county. 5. —. Ebook and Texts Archive > Canadian Libraries > University of Toronto – John M. Kelly Library > Historical notes on English Catholic Missions. Internet Archive. [Online] http://archive.org/details/historicalnoteso00kelluoft. 6. Gandy, M. Catholic Family History: A Bibliography Of General Sources. London : Michael Gandy, 1976. ISBN 0 9520535 8 6.